The Maine Boathouse is a luxurious private residence located on the water in picturesque South Freeport, only 30 minutes from the Portland airport. Its unparalleled harbor views, sea breezes, and stunning sunsets make for a beautiful and relaxing escape from the hustle and a glamorous backdrop for intimate weddings and events. Built in 1813 on pilings, the boathouse is one of the oldest structures in South Freeport. Take a drive to the nearby LL Bean flagship campus or enjoy the exclusive outlets. Heron Cottage sits over the Harraseeket River and affords unobstructed panoramic views of Freeport Harbor. Sit back, relax, and watch the boats sail away toward the Casco Bay and Maine’s hundreds of nearby islands. 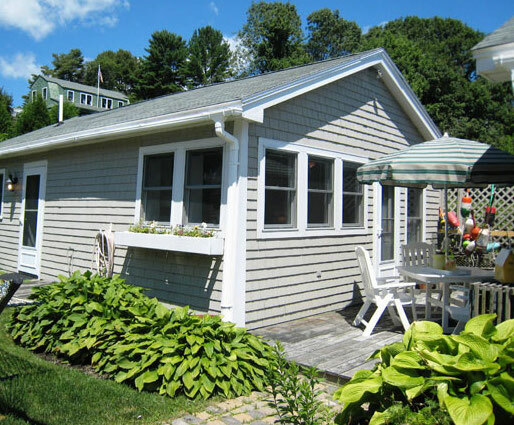 Osprey Cottage offers its guests comfortable accommodations and partial ocean views. Walk to the local lobster pound for a bite, swim or kayak from your own private dock, and enjoy “the way life should be”. This coastal Maine venue combines the quintessential “Downeast” Maine experience with historic charm, providing an elegant backdrop for your rehearsal dinner, wedding, or event. Our overnight cottages offer a unique opportunity to keep your guests close to the celebration. Over its 200-year history, the boathouse has overseen the building of tall wooden ships and has even harbored a liquor-smuggling bootlegger operation during the prohibition era. Now, you can watch the ever-changing landscape of Freeport Harbor while you relax with a cocktail. Heron is beautifully furnished and includes a fully equipped kitchen, living room with queen sleeper-sofa, bedroom with queen bed, and a bathroom with shower. Sleeps up to four guests. Osprey features a fully equipped kitchen, living room with sleeper sofa, two bedrooms (queen and twin bunk beds), bathroom with shower, and a washer and dryer. Sleeps up to six guests. Enter your email address below to receive news and promotions.